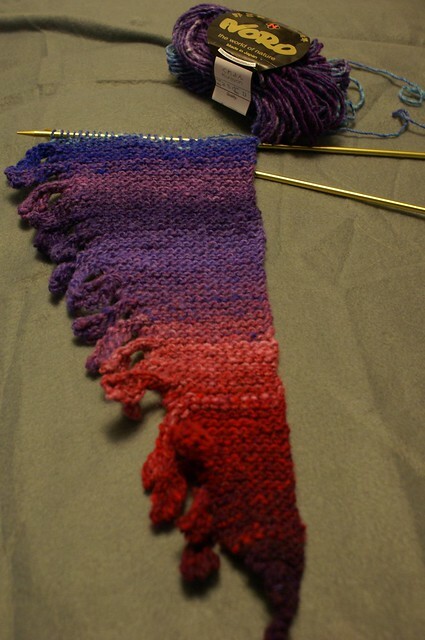 I'm making progress on the Shizuku scarf I started a week ago. I'm enjoying the pattern a lot more than the scarf I made for Chris, but I'm not so keen on the how the color is turning out. It's a little lighter than I would have liked. I suppose I'll see what it looks like once I get into more of the blue and purple in the rest of the first skein and into the second one I'll need to use shortly. Maybe it will look nicer against a black jacket.